PXE (Preboot eXecution Environment) Server allows unattended or automated OS installation over the Network.The main benefit of pxe is that we don’t need any bootable drive to boot OS(Operating system) and we do not need to to burn any ISO file into DVD or usb device. Once the PXE server is configured we can install hundreds of System at the same time over the network.As it works on Client-Server architecture, to get the OS installation on clients, boot the clients via PXE option. 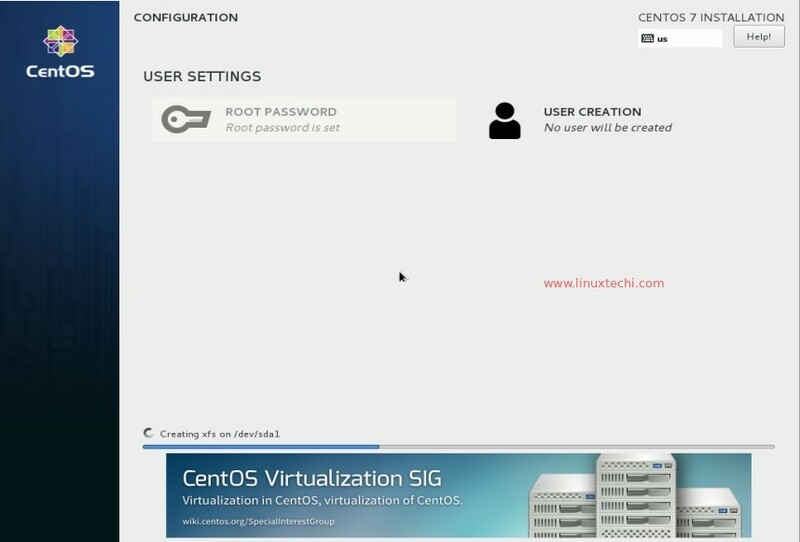 In this article i am going to setup PXE Server on CentOS 7.x and then will try to install OS on the client using pxe boot. When we install dhcp package then a sample configuration file of dhcp server is created at “/usr/share/doc/dhcp*/dhcpd.conf.example“, though the configuration file of dhcp is at ‘/etc/dhcp/dhcpd.conf’. 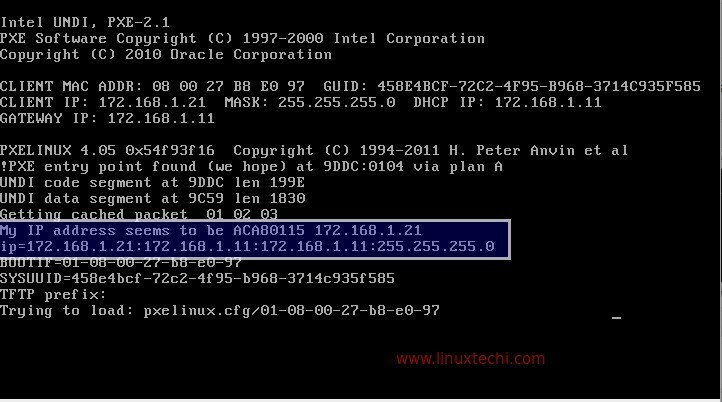 Copy the following lines into the file ‘/etc/dhcp/dhcpd.conf’, replace the ip subnet and other details as per your environment. TFTP (Trivial File Transfer Protocol ) is used to transfer files from data server to its clients without any kind of authentication. In case of PXE server setup tftp is used for bootstrap loading. To config tftp server, edit its configuration file ‘ /etc/xinetd.d/tftp’, change the parameter ‘disable = yes‘ to ‘disable = no’ and leave the other parameters as it is. Step:5 Create kickStart & PXE menu file. Before creating kickstart file, let’s first create the root password in an encrypted string because we will using that encrypted password string in kickstart file. Copy the following content into the new kickstart file. Please modify the kickstart file as per your needs. Create a PXE menu file (/var/lib/tftpboot/pxelinux.cfg/default), copy the following contents into the pxe menu file. Step:6 Start and enable xinetd, dhcp and vsftpd service. Use the beneath commands to start and enable xinetd, dhcp and vsftpd. Created symlink from /etc/systemd/system/multi-user.target.wants/dhcpd.service to /usr/lib/systemd/system/dhcpd.service. In Case SELinux is enabled, then set the following selinux rule for ftp server. Up to this point, PXE server installation and configuration is completed now. Step:7 Boot the clients with pxe boot option. As can see above that installation has been started with any human interaction. I hope you enjoy the installation and configuration of PXE server. Please share your feedback and comments. Great article! Do you make could a tutorial about LTSP on the CentOS 7? Please, I can’t find anything that’s works. Will be a big help for me! I have that working but I recently did a kernel update via yum and it seems like ‘uname -r’ still shows the old version. I believe I have to update the vmlinuz and initrd files on the tftp server, is that correct? How do I do that? Hello , One has to reboot the system when the new kernel is installed. In case after reboot if ‘uname -r’ still shows old kernel version then recheck the grub config file and make the changes so that system boots with new kernel. It is not recommended to update the kernel one should always install new kernel . Please check the selinux status, if it is enabled, write selinux rule for ftp. Apart from this also verify the firewall status. Thanks, its great article and also easy to understand ! How about showing us how to install different OS versions of Linux or even different OS distro’s using the method in this article. Not bad at all. 2)FTP server configure in windows 7 and getting error 550 file unavailable and the system cannot find the specified. I captured the traffic nic of my windows 7 system and got this error in pcap. someone can me help me. Thanks for the simple, effective tutorial. If you are creating a VM, it needs to have more that 1GB (2GB works) of memory or you get a “no space left on device error”. thanks a lot – spent hours on this “out of memory” problem. I am having an issue that when I do this, the pxe menu displays, but I am unable to enter any keyboard input, the menu just freezes. Good instructions and easy to follow. I would add a bit of description about the TFTP setup, as the permissions of the /var/lib/tftpboot directory can be problematic.